Girls in the fourth through sixth grades work on their dribbling at Arcanum’s youth girls basketball camp. ARCANUM – Girls in the fourth through sixth grade got a lot of one-on-one attention from the Arcanum High School girls basketball players at the Lady Trojans’ youth basketball camp this week. 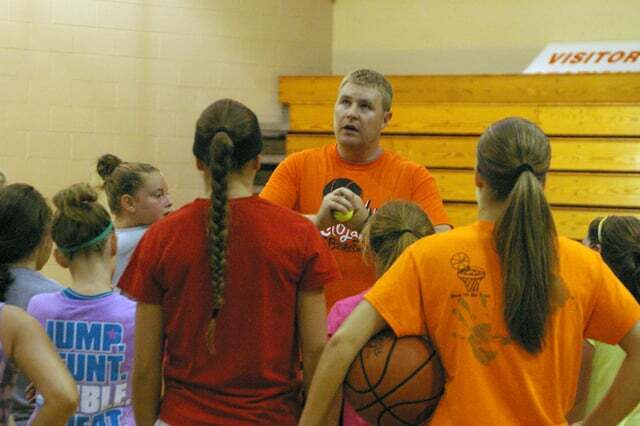 First year Arcanum varsity girls basketball coach Matt Grote said it was a great turnout as more than 20 girls attended the youth camp. There also were 15 to 20 high school players helping Grote lead the camp, giving plenty of opportunities for the youth campers to learn from the Lady Trojans. The Trojans taught the youth players a lot of fundamentals with emphasis on areas such as ball handling and shooting. Grote and his high school players made sure the campers had good footwork, kept their eyes up and learned proper defensive techniques. “We’re mainly concentrating on having good footwork, making sure our correct foot leads when we go,” Grote said. During the four-day camp the girls showed a lot of progress in learning about basketball. The camp ended with competitions including a dribbling showcase, shooting competitions and one-on-one games. “The main thing is they’re having a lot of fun,” Grote said.